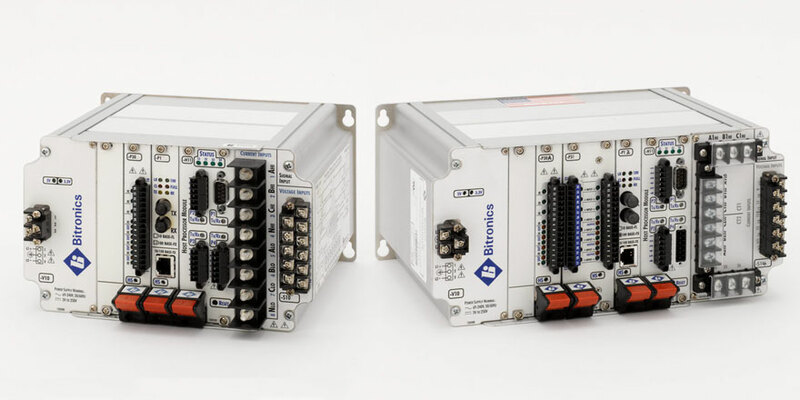 The Bitronics M871 (Single Line, Dual Bus) and M872 (Dual Line, Dual Bus) IEDs provide a complete solution for monitoring and recording in substation applications. They provide a scalable, low-cost distributed disturbance recording solution that meets all three PRC-002 requirements in a single unit and supports peer-to-peer GOOSE messaging for cross-triggering without hard-wired contacts. The M871 and M872 complement relays by providing independent, higher-fidelity waveform capture with two disturbance recording modes and trend recording not typically found even in the most advanced digital relays. They also provide features such as fault location and SCADA communications that can automate a substation where electro-mechanical relays are used. The ability to support multiple physical links and protocols simultaneously allows easy integration in retrofit applications or newer substation automation projects. The M871 and M872 serve as a front-end to SCADA while also providing system-wide access to important substation data. Multi-mode recording and high speed, high accuracy measurements allow analysis of Network faults, reactions of protective devices, dynamic response of the network, long-term trends, revenue readings at interties, substation equipment performance. The Bitronics M571 and M572 offer a similar function to the M871/M872, but in a fixed, rather than modular design, and with fewer options. The M571 and M572 are available for sale through 2015, but will become obsolete after that. The M871/M872 are available as replacements for automation and recording applications, while the PowerPlex II can be used as an Ethernet transducer where accurate, high-speed measurements are needed, and for direct connect up to 600 V ac line-to-line. Current input for the S10 Signal Input module has a nominal range of 0 – 5A ac, linear to 100A ac symmetrical rms at all rated temperatures. Current input for the S13 Signal Input module has a nominal range of 0 – 5A ac, linear to 100A ac symmetrical rms at all rated temperatures. Waveform recorders have up to 14 assignable analog channels with adjustable sampling rates of 32 or 64 and 128 samples per cycle. In the M871, the sampling rate can increase to 256 samples per cycle if only 7 channels are connected. Pre-trigger and post trigger size is assignable. Digital inputs can be included in the recording. Stored in COMTRADE format. The Disturbance recorders have up to 64 assignable measurement channels with a selectable time resolution from one cycle to sixty seconds. Pre-trigger and post trigger size is assignable. Stored in COMTRADE format. The trend recorders have up to 230 selectable parameters with time resolution of one minute to twelve hours. Choice of instantaneous or min, max and average. Sequence of Event recording has 5,000 event record storage with events time stamped to 1 microsecond. Stored in Text format. An IRIG-B port adapter with BNC connector is available that accepts modulated signals and interfaces directly to one of the serial ports. Short Chassis, with 3 optional module slots at 8.5” wide. Refer to ORDER GUIDE 200. Intermediate Chassis with 5 optional module slots at 11.65” wide. Refer to ORDER GUIDE 202. Long Chassis with 6 optional module slots at 13.45” wide. Refer to ORDER GUIDE 201. Intermediate Chassis with 5 optional module slots at 11.65” wide. Refer to ORDER GUIDE 203. Long Chassis with 6 optional module slots at 13.45” wide. Refer to ORDER GUIDE 204. V10 universal power supply module, rated 20-300V dc/55-275V ac. One signal input module. There are choices of an S10, S11 or S12 signal input module. V10 universal power supply module, rated 20-300V dc/ 55-275V ac. One signal input module. There are choices of an S13, S14 or S15 signal input module. The choices of optional modules and their max quantity depend on the chassis size and what module space is available. Bitronics has been providing excellence in digital metering for local indication and SCADA communications for over 20 years. The Bitronics 60 Series, advanced panel meters, continue this tradition of excellence, providing solutions for 3-phase metering. The Bitronics 60 Series are multifunction meters with a range of measurement capabilities. A deep and integrated knowledge of engineering, manufacturing, and quality processes – an expertise that can provide strategic value to specialty electronics manufacturers looking for a reliable printed circuit board design and assembly partner. The D650 Detached Display is targeted to replace the Model M870D Detached Display. Bitronics offers new power monitoring instruments and packaging options that can connect to pole top sensors to provide fault indication, peak fault currents and full power system measurements. Do you know that you can install a fault location and recording solution, and begin transmitting substation SCADA data in less than an hour without taking an outage? NovaTech, working with a Mid-Atlantic Utility, designed and packaged a solution into a small enclosure for retrofit at 69kV substations. Bitronics has been sponsoring a team of three high school seniors at the Bethlehem Vo-Tech School in the SkillsUSA Competition and they are heading to Nationals! These are the new features you have been asking for on the Bitronics 878 High Density I/O and now the new connector can be ordered for use on all P3x I/O modules…. This video shows how a Northwest utility uses the Bitronics M871 to captures a fault and provides key information to the utility. Features such as SCADA data, distance-to-fault, disturbance recording, etc., that weren’t present, can be made available from the M87x. Installing the Bitronics M871 to automate the distribution substation is a low-cost option to performing a relay upgrade or installing an expensive fault recorder. Sound bites from the presentations given at 2016 DistribuTECH on SCADA, Cyber Security, 61850, and Systems and Services. Almost half of NovaTech’s business is in Systems and Services including web page design, panel design, math and logic development, Orion configuration, and onsite installation and commissioning. Mark Matassa explains how our engineers can work with you to reduce project execution time at the 2016 DistribuTECH Conference and Exhibition in Orlando, Florida. Bitronics Measurement and Event Recording products have been used throughout the US electric utilities and internationally in traditional and cutting-edge “Smart Grid” applications. The products have been made in Bethlehem, PA, USA since 1908 and continue to be the gold standard for reliability and innovation in the electric utility substation measurement market.